1. Drug Discovery and Development Research Group, College of Pharmacy and Nutrition, University of Saskatchewan, 110 Science Place, Saskatoon, SK S7N 5C9, Canada. 2. School of Life Science, Foshan University, Foshan, Guangdong 528000, P.R. of China. 3. Entry-Exit Inspection and Quarantine Bureau, Nanhai, Guangdong 528200, P.R. of China. Sphingosine-1-phosphate (S1P) is an important sphingolipid metabolite regulating key physiological and pathophysiological processes such as cell growth and survival and tumor angiogenesis. Significant research evidence links elevated cellular S1P concentration to cancer cell proliferation, migration and angiogenesis. Physiological levels of S1P are tightly regulated and maintained at the low nanomolar level. In cancer, S1P may exist well beyond the low nanomolar level. Recently, we reported that S1P selectively induces cell apoptosis of the breast cancer MCF7 cell line at concentrations higher than 1 µM and co-administration of 1 µM S1P significantly increased the cytotoxicity of chemotherapy drug docetaxel. In this study, we show that S1P caused minor increases in cell proliferation or apoptosis, in a concentration-dependent manner, yet co-administration of 10 µM S1P exhibited a significant synergistic effect with chemotherapy drugs docetaxel, doxorubicin and cyclophosphamide. S1P increased the cytotoxic potential of each drug by 2-fold, 3-fold, and 10-fold, respectively, against the breast cancer metastatic cell line MDA-MB-361. This synergism may suggest improved anticancer drug therapy by co-administration of exogenous S1P. Keywords: Brain-metastasized breast cancer, apoptosis, cytotoxicity, chemotherapy, sphingosine-1-phosphate. Sphingosine-1-phosphate (S1P) is a bioactive metabolite in the sphingolipid metabolic pathway. It regulates important physiological and pathophysiological processes such as cell growth and survival, angiogenesis and cell migration (1-3). S1P exerts its biological functions both extracellularly and intracellularly (4-6). Its extracellular function follows an “inside-out” model, in which S1P is synthesized inside the cell and then transported out of the cell to trigger a family of G-protein coupled receptors designated sphingosine-1-phosphate receptors 1-5 (S1PR1-5) to promote cell proliferation, survival and migration and oppose cell apoptosis (4, 5, 7, 8). Its intracellular function is not well defined but S1P is suggested to act as a second messenger regulating calcium mobilization and cell proliferation and survival (3, 6, 9, 10). 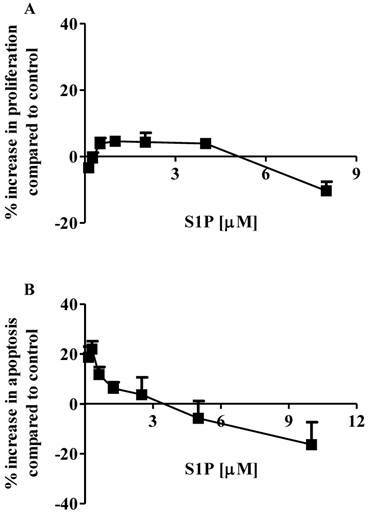 S1P may also promote cell apoptosis, and emerging evidence suggests that the apoptotic effect of S1P correlates with its intracellular function (11, 12). Recently, we reported that exogenously administered S1P can selectively induce cell apoptosis of human breast cancer MCF7 cells at concentrations higher than 1 µM and improve the therapeutic efficacy of the chemotherapy drug docetaxel (13). Since the 5-year survival rate drops dramatically following breast cancer metastasis to distal organs such as bone, liver and brain, it is of special importance to investigate whether S1P could increase the therapeutic efficacy of chemotherapy drugs against metastasized breast cancer cells, especially brain-metastasized breast cancer cells. Brain metastasis is observed in approximately 10% of breast cancer patients, and recurrence is common due to reduced efficiency of chemotherapy drugs, such as doxorubicin and carboplatin, and targeted therapy drugs, such as trastuzumab, to cross the blood-brain barrier (14, 15). A very recent study showed that the binding of S1P to S1PR1 in brain capillaries decreases basal P-glycoprotein transport activity and improves the delivery of therapeutic agents like paclitaxel to the brain (16). Therefore, co-administration of exogenous S1P with chemotherapy drugs may increase both the cytotoxicity of the chemotherapy drugs against the brain-metastasized breast cancer cells and their penetration into the brain. Human brain-metastasized breast cancer cell line MDA-MB-361 was purchased from the American Type Culture Collection (ATCC) (Manassas, VA). The cells were cultured in T-75 culture flasks in ATCC-formulated Leibovitz's L-15 medium with 20% fetal bovine serum under a humidified, 0% CO2 atmosphere at 37 ⁰C. The cell culture media were changed every 2-3 days. The MDA-MB-361 cells were plated in 96-well plates and grown to 70 - 80% confluence before being treated with S1P for 18 h. The S1P (in ethanol) concentration was ranging from 0.13 µM to 8.0 µM for proliferation and 0.16 µM to 10.0 µM for apoptosis. Treatment with ethanol was used as negative control. Cell proliferation and apoptosis were measured using the CellTiter 96 AQueous Non-Radioactive Cell Proliferation Assay and the Caspase-Glo® 3/7 Assay systems from the Promega Corporation (Madison, WI), respectively. The MDA-MB-361 cells were plated in 96-well plates and grown to 70 - 80% confluence before being treated with S1P at concentrations of 1 µM and 10 µM. Treatment with ethanol was used as negative control. The S1P cytotoxicity was measured at exposure time of 6 h, 12 h, 24 h, 48 h and 72 h, respectively, using the CytoTox96® Non-Radioactive Cytotoxicity Assay from Promega Corporation. The MDA-MB-361 cells were plated in 96-well plates and grown to 70 - 80% confluence before being treated with three chemotherapy drugs, docetaxel (0.63 - 40 µg/ml), doxorubicin (0.31 - 20 µM) and cyclophosphamide (32.5 µM - 2 mM), alone or in combination with 1 µM or 10 µM S1P for 18 h. These chemotherapy drugs were prepared in ethanol except doxorubicin which was prepared in 50% water/ethanol, and treatment with ethanol or 50% water/ethanol was used as negative control. The cytotoxicity of each treatment was also measured using the CytoTox96® Non-Radioactive Cytotoxicity Assay from Promega Corporation. The effects of S1P on the proliferation and apoptosis of the brain-metastasized MDA-MB-361 cell line were examined with a range of S1P concentrations (0.13 - 8.0 µM for proliferation and 0.16 - 10.0 µM for apoptosis) for 18 h of exposure. Surprisingly, MDA-MB-361 cells were not sensitive towards exogenous S1P treatment (Fig. 1). Cell proliferation was marginally increased by approximately 5% as S1P concentrations ranged from 0.5 µM to 4 µM. S1P concentrations exceeding 5 µM caused a small degree of inhibition of MDA-MB-361 cell proliferation (Fig. 1A). With respect to apoptosis, S1P gave a concentration-dependent bell-shaped response to exogenous S1P with maximal MDA-MB-361 cell apoptosis achieved at 0.3 - 0.7 µM (Fig. 1B), which is significantly different from the concentration-dependent sigmoid-shaped apoptotic response observed in the MCF7 cells (13). In addition, the maximal MDA-MB-361 cell apoptosis was only about 20% higher than control, even much lower than that for the normal mammary gland epithelial MCF12A cell line (13). When concentrations exceeded 3 µM, S1P caused inhibition of cell apoptosis. Therefore, unlike the MCF7 cells, exogenous S1P did not selectively induce apoptosis of MDA-MB-361 cells. Percentage increase (mean ± standard deviation) of cell proliferation and apoptosis of human brain-metastasized breast cancer MDA-MB-361 cells (A: proliferation; B: apoptosis - caspase 3/7) after exposure to different S1P concentrations for 18 h. Treatment with only ethanol was used as negative control. Data were obtained from three independent experiments, each of which was carried out in triplicate. Cell necrosis is an additional mechanism of cancer cell cytotoxicity. S1P cytotoxicity against MDA-MB-361 cells was evaluated for up to 72 h of exposure at concentrations of 1 µM and 10 µM. As shown in Fig. 2, S1P did not cause any cytotoxicity to the MDA-MB-361 cells at a concentration of 1 µM. Since S1P was shown to cause a 10% increase in MDA-MB-361 cell apoptosis at 1 µM (Fig. 1), prolonged treatment (> 72 h) might be needed in order to observe the cell death. At 10 µM, S1P exhibited a time-dependent positive linear cytotoxic response towards MDA-MB-361 cells (Fig. 2). Cytotoxicity was increased by about 35% compared to control after 72 h of treatment. Extended treatment with high concentrations of S1P (≥ 10 µM) would likely enhance its cytotoxicity against MDA-MB-361 cells. Although high concentrations of exogenous S1P may lead to necrosis of normal tissues, severe S1P-associated side effects are not expected due to the following two reasons: first, S1P is an endogenous molecule and should possess lower toxicity and better tolerance than synthetic anticancer agents; and second, the human body may have a response system to deal with high S1P concentrations as the normal serum S1P level is around 0.2 - 0.9 µM (17) and short time of exposure to high concentrations of S1P is unlikely to be life-threatening or severely detrimental as the serum S1P level was observed to rise up to 15 µM in children patients with juvenile-onset systemic lupus erythematosus (JSLE) (18) and the 5-year survival rate for JSLE is close to 100% (19). Percentage increase (mean ± standard deviation) in cytotoxicity following 1 µM (solid squares) and 10 µM (solid diamonds) exposure of S1P to human brain-metastasized breast cancer MDA-MB-361 cells at different exposure times. Treatment with only ethanol was used as negative control. Data were obtained from three independent experiments, each of which was carried out in triplicate. Drug combination therapy, such as paclitaxel plus carboplatin, is widely used in breast cancer treatment to increase therapeutic efficacy and decrease potential toxicity as compared with mono-drug therapy (20, 21). In our previous study, we showed that co-administration of 1 µM S1P reduced the EC50 of docetaxel from 3.4 µg/mL to 2.1 µg/mL against the MCF7 cells (13). In the current study, we expanded the in vitro evaluation of the S1P-combined therapeutic efficacy against the MDA-MB-361 cells to three chemotherapy drugs, docetaxel (0.63 - 40 µg/ml), doxorubicin (0.31 - 20 µM) and cyclophosphamide (32.5 µM - 2 mM). Drug cytotoxicity was measured alone or in combination with 1 µM or 10 µM S1P after 18 h of exposure. 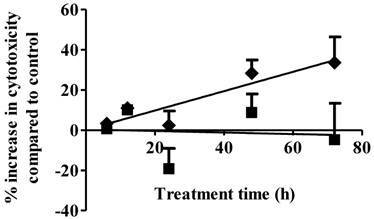 Co-administration of 1 µM S1P increased the cytotoxicity of cyclophosphamide but decreased the cytotoxicity of docetaxel and doxorubicin against the MDA-MB-361 cells (Fig. 3). However, neither the cytotoxicity increase nor the cytotoxicity decrease was statistically significant (docetaxel, p = 0.21; doxorubicin, p = 0.43; and cyclophsophamide, p = 0.34). Co-administration of 10 µM S1P caused a statistically significantly increase in the cytotoxicity of docetaxel by >2-fold, doxorubicin by >3-fold, and cyclophosphamide ~10-fold. These data suggest S1P has a synergistic effect with docetaxel, doxorubicin and cyclophosphamide at 10 µM. Since the functional mechanisms for docetaxel (anti-mitotic), doxorubicin (intercalation of DNA) and cyclophosphamide (alkylation of guanine) are quite different, further investigations are warranted to elucidate the mechanism of S1P synergism with these drugs. To treat brain-metastasized breast cancer, therapeutic agents must cross the blood-brain barrier. Recently, it was shown that S1P binding to its receptor S1PR1 in brain capillaries increased delivery of therapeutic drugs into the brain, and possibly of S1P as well, through reductions in basal P-glycoprotein transport activity (16). Although systemic S1P administrations may not achieve therapeutically effective S1P levels in the brain (i.e. 10 µM), high S1P concentrations are possible with intratumoral injections or through the use of novel drug delivery systems. Additional studies using cancer-cell targeted nanoparticles warrant investigations given the potential improvement in anticancer therapy against brain metastasis of breast cancer afforded by the synergistic effect of S1P with typical cancer chemotherapeutic drugs. The potential therapeutic benefit of co-administration of S1P also warrants investigations into its potential toxicity, particularly potential detrimental effects to the central nervous system if intratumoral injection or nanodelivery vehicles are exploited to enhance S1P levels in the brain. Percentage increase (mean ± standard deviation) in cytotoxicity of docetaxel (A), doxorubicin (B), and cyclophosphamide (C) against the human brain-metastasized breast cancer MDA-MB-361 cells at different concentrations alone (solid squares), in combination with 1 µM S1P (solid diamonds), or in combination with 10 µM S1P (solid triangles). The cytotoxicity was measured 18 h after exposure. Treatment with ethanol (for docetaxel and cyclophosphamide) or 50% water/ethanol (for doxorubicin) was used as negative control. Data were obtained from three independent experiments, each of which was carried out in triplicate. We showed that S1P was not an efficient stimulator of cell proliferation or apoptosis towards the brain-metastasized breast cancer MDA-MB-361 cells. However, co-administration of 10 µM S1P exhibited a synergistic effect with chemotherapy agents docetaxel, doxorubicin and cyclophosphamide increasing their cytotoxicity against MDA-MB-361 cells by almost 2-fold, 3-fold and 10-fold, respectively. A research grant from the Canadian Breast Cancer Foundation (CBCF) and an internal grant from the College of Pharmacy and Nutrition, University of Saskatchewan, supported this work. Ahlam Sultan would like to acknowledge the Saudi Arabia government for a graduate scholarship. Corresponding author: J. Yang, Drug Discovery and Development Research Group, College of Pharmacy and Nutrition, University of Saskatchewan, 110 Science Place, Saskatoon, SK S7N 5C9, Canada, Tel: 306-966-6361, Fax: 306-966-6377, Email: jian.yangca.